Make the most of your web presence, even if you don’t sell your product online — that’s the lesson Terrapin Beer can teach any business owner. This craft beer company with distributors in 16 states all around the U.S. has a strong online presence on social media, where they establish brand awareness and promote events while selling various merch on their website with Ecwid. We talked to Leah Kuck, who alone manages social media, the website, press relations, and several other projects for Terrapin Beer. Our questions were: how did you manage to gain almost 100,000 social media followers, how a single social campaign brought 1000+ user-generated product photos and how exactly digital marketing matters to a B2B company? If you are sure social media marketing has little to do with actual sales in the B2B segment, chances are you’ll find this piece mind-changing. Grab a can and dive in. The name of Terrapin Beer is a tribute to the Grateful Dead and their album Terrapin Station. Our founders are pretty big fans. We use turtles in most of our designs because of the connection to Terrapin. Beer names come from all over the brewery. Usually, we decide which styles to brew, then ask for help from everyone to submit names, and then pick the best one! The niche didn’t lie on the surface back when Terrapin beer first came to life. Back when we started distributing (in the early 2000s) people didn’t know as much about craft beer, or local beer. We found our first distributor by reaching out to folks in Athens and Atlanta and seeing who was interested! Our first 1,000 bottles we sold were Rye Pale Ale, while we were contract brewing. As mentioned above, social media marketing doesn’t seem to be the first thing that comes to mind when you think of promoting a B2B company. How many of those thousands of followers are potential distributors? Is it actually worth spending hours on content creation? Now that the strategy is set and clear, let’s discover some of the tactics. I would actually say that Facebook, Twitter, and Instagram are our main focus, as we also have Pinterest and Untappd profiles that I manage. Facebook, Twitter, and Instagram all have different qualities that make them successful. Facebook is best for driving people to our website (and online store!) while Twitter is better for real-time interaction. Instagram is extremely helpful as a visual tool. We share a lot of content across all social platforms, but we focus on high-quality images on Instagram, real-time updates on Twitter, and brand info and event posts for Facebook. On Instagram, I don’t have color guidelines, but I do try to only use good-quality, focused photos. We don’t use many filters either. My biggest focus in terms of guidelines is on content. If it’s not a clear photo of beer or merchandise, I tend to use it on another platform. I’ve noticed that photos of people as the focus get almost half the likes of photos that focus on our beer. Do I count as a professional? (laughing) Our marketing department creates all of our own content, with the exception of a few large promotions, like Take Terrapin. Our professional photographer of choice is actually also one of our Sales Representatives. Her name is Leigh Germy and she does freelance photography on the side! I try to keep text short and sweet on all platforms. If you don’t capture people’s attention in about 3 seconds, they’ll scroll on to the next platform. When writing, I try to focus on being entertaining but informative. 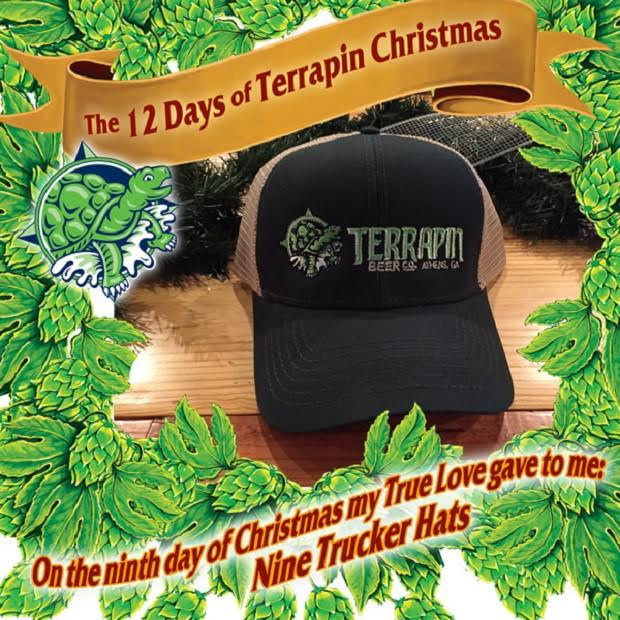 Terrapin Beer’s content strategy breaks down to visual content, even posts, brand info, and real-time updates — but they are also good at contests, giveaways, and holiday marketing. Read on to have a closer look. At the moment, Terrapin Beer’s social profiles look very solid — followers count tens of thousands of people, both on Instagram and Twitter. It’s definitely worth another how-question. I can tell you how we got our most recent 1,000 followers: on Twitter, it’s all about relevance and interaction. Being retweeted is a great way to get your message in front of people who don’t already follow you. On Instagram, it’s about high-quality photos and appropriate hashtags! Do hashtags matter that much?, you may wonder. Not so long ago we did our little investigation on the actual use of Instagram hashtags. I’m ALL about some hashtags. I think they’re a great way to be discovered, especially on Instagram. I try for about 5 – 7 relevant hashtags per post, focusing on things like #craftbeer #IPA, etc. I’d credit most of our 70% growth on Instagram last year to relevant hashtags and clear, focused photos. We’ve used paid ads on Facebook, mostly for events, but not paid tweets. For us, Twitter is more about interaction. Facebook’s algorithm also makes it more important to pay for sponsored posts than Twitter’s.Our sales representatives are tasked with doing at least 6 events a month, so it can be a lot of work. Planning up front makes everything so much easier! Though the number of followers matters a lot, it isn’t the main metric in terms of successful social media marketing. Increasing engagement is a more important part of the job. Ideally, a content strategy that works has to bring you more new followers that will be highly engaged with your brand. We’ve seen some pretty steady growth, with some bumps up during our #TakeTerrapin campaign last summer. We featured people’s posts on Instagram who used the hashtag #TakeTerrapin and showed us cool photos of where they brought our beer. We got some amazing user-generated content out of the promotion, as well as an increase in followers! We also brought #TakeTerrapin into our Off Premise Accounts (liquor stores, grocery, etc. ), promoting our beer and social media at the same time! We do a few contests. One of our big ones is a monthly raffle for an Osprey Pack (terrapinbeer.com/osprey). We run the giveaway through rafflecopter, which gives you entries for following Terrapin on various social platforms. We also do giveaways for new gift shop items throughout the year, which helps drive folks to our online shop! We usually do either Tag a friend on Instagram or Retweet to win on Twitter for those! We do almost double our monthly sales volume in our online shop between Thanksgiving and our shipping cutoff for Christmas, partially because we’re promoting on social media. We often do a discount specifically for people on our email list, who are our most loyal online followers. Two years ago we did a 12 days of Сhristmas promotion and talked about a new item every day for the 12 days leading up to our shipping cut-off! It was a lot of fun to write. We do some print advertising with one of our local papers, and also advertise in a few beer magazines. We tend to focus our efforts on social and online advertising, as it’s easier to track, and often cheaper! Our different cross promotional varies based on the partner. 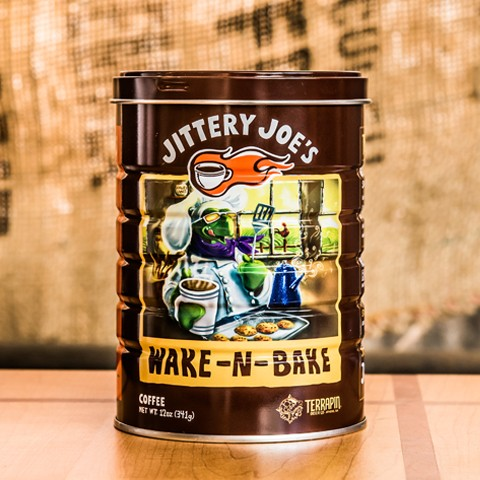 A great example of our partners is actually Jittery Joes Coffee. They’re a local coffee roaster who makes a coffee blend specifically for our beer Wake-n-Bake (available in the winter) but they also produce the coffee blend for sale in their shop year round! We’ve got a great relationship! We often are approached about ideas, but sometimes we approach others about partnerships. Leveraging a partnership for marketing definitely varies on the partner, and what we’re doing together! For the Walking Dead beers, we definitely do merchandise around the beers as well as marketing promotional. We have a decent email list, and send about one email a month, depending on the time of year and what is going on! I think email is great for getting in touch with people who care enough about your brand to let you into their inbox. They’re often our most loyal customers! 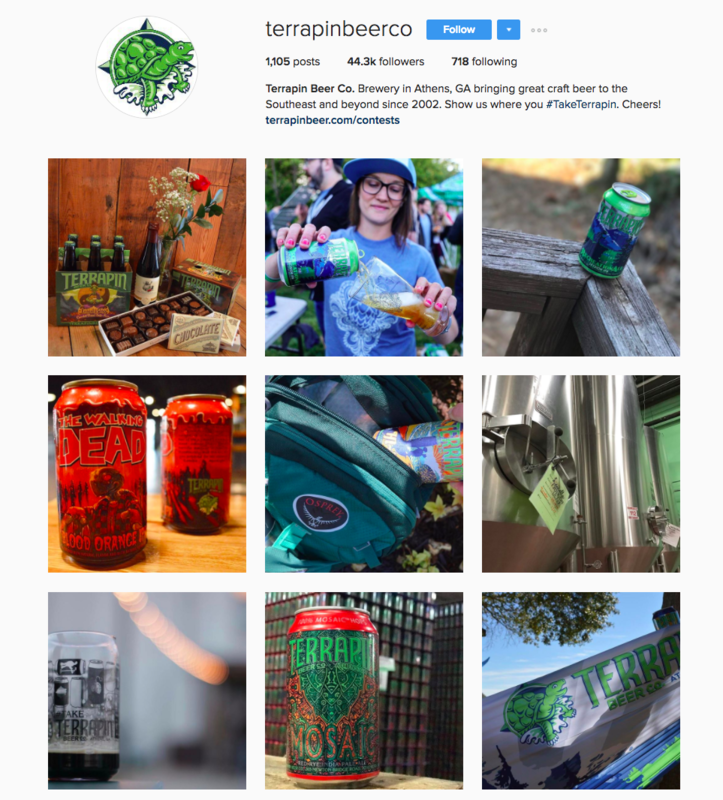 We also peeped at how Terrapin Beer is checking in with the progress and what exactly they track to keep doing successful social media marketing. We mostly focus our meetings on beer releases, events, and promotions happening around the brewery and in our market, touching on the Social Strategy for each piece. We do tend to do an audit once a year and look at where we could improve or what we’re doing well! We use Google Analytics as well as what is available in CoSchedule, and at the beginning of each month, I grab simple follower numbers from every platform we’re on (this started before Instagram had any analytics!). Since we’ve started to talk tools, let’s learn which of them help Leah do such a big job and how to make the most of them. I manage social media, the website, press relations, and several other projects. With a brewery, there are lots of new beer launches and other exciting things happening all of the time, and it can be a lot to juggle. 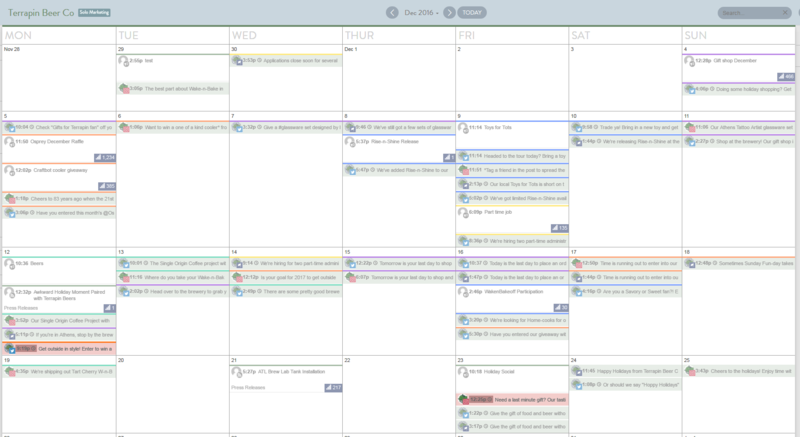 I use CoSchedule to manage all of our social media platforms and get an idea of what is publishing when. It also lets me see how much I’m talking about each beer! When I was juggling more than just communications, I did a lot with If This, Then That. It’s a program that posts things over to other platforms. For example, when we posted on Instagram, it used to push over to Twitter as a native tweet. Sometimes, if the caption was too long, it would truncate and look unprofessional. Now that I’ve got CoSchedule, I’ve gotten rid of that feature. What helps keep everything running smoothly is what we call our scorecard. That way I can see what’s been done by our Graphic Designer and Merchandise Coordinator, and request any additional information. I think the brewing industry has an interesting 5 years ahead. There are currently over 5,000 breweries in the US, and over the next few years, I think we’ll see a greater focus on branding and quality. Terrapin has some big plans! We’re actually opening a second brewing location at Suntrust Park (home of the Atlanta Braves), and we’re currently working on how to best use that to our advantage from a marketing standpoint. We’re figuring out the online presence that the new facility will have in the next couple of weeks. Our 5-year plan is actually shifting a bit, but we’re hoping to continue growing and open up distribution in some more states. Make it fun! So many things feel overdone now, especially in the beer industry. If you put a fun twist on your event and market it well, you’re set! Do you want to see your story on the Ecwid blog? Drop us a line on blog@ecwid.com!